physical, even something that you could potentially touch (image source). 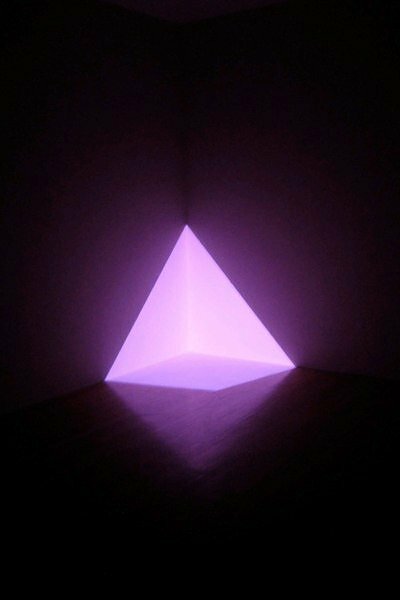 Many of James Turrell's works attempt to make light, something wholly non-physical, cross the standards boundaries of perception into an almost physical and material realm. The dramatic color and light saturation that dominate his pieces suggest an entirely new way of experiencing light that goes beyond the mere visual sense. Turrell's undergraduate background in psychology has informed his works through their ability to challenge standard modes of perception. 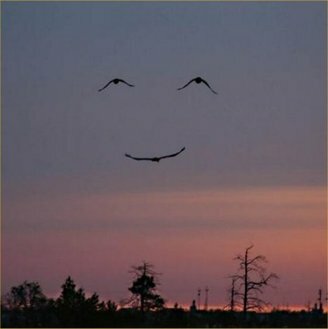 the image created is different from the objects. not see in that context (image source). But what are optical illusions? Here's a real life example of optical illusions by Mike Hewson, a public art commission in New Zealand that pays homage to the Christchurch Normal School, a building slated for demolition after the 2011 earthquake. Can you tell which type(s) of optical illusions Hewson is working with from the three categories below? and the lilac discs disappear (image source). to demonstrate the distinction between "seeing as" and "seeing that" or, an example of a cognitive visual illusion. 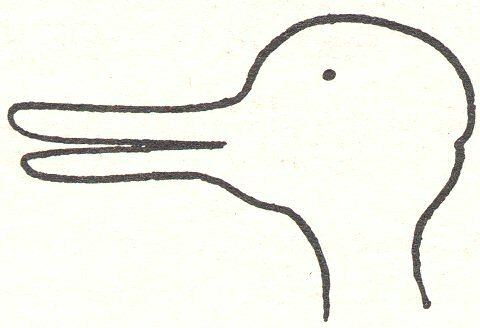 There is no correct answer to whether this is a drawing of a duck, or a rabbit. Cognitive illusions are a result of our conceptions and assumptions about the world, which we impose upon visual stimuli. 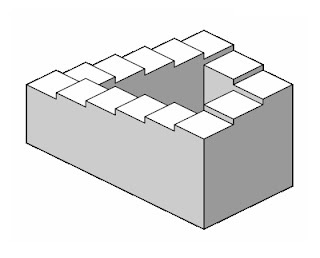 This can lead to four types of cognitive illusions: ambiguous illusions, distorting/geometrical-optical illusions, paradox illusions, or fictions (image source). The Necker Cube is a well known example of an ambiguous illusion. 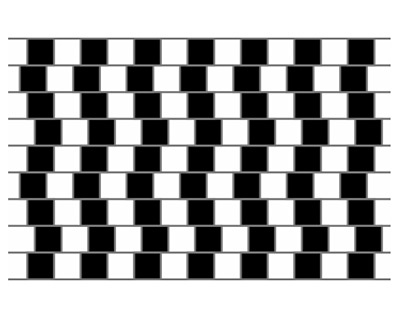 The arrangement of the lines themselves are ambiguous, meaning nothing in the lines themselves suggest for the lower left face to be the "front" face. Computers do not have the same consistency as humans do in seeing this "front" face, rather, they see other interpretations with equal frequency. Distorting illusions are some of the most common because they happen in everyday life as well as in geometric/artistic constructions. The photo on the left of the moon illustrates how our eyes are not equipped to see the true size of the moon, rather it depends on where the moon is in the sky. When directly overhead, the full moon looks much smaller than when it's on the horizon. The psychological reasons behind this phenomena are still being debated. Paradox illusions are caused by images that cannot exist in real life, but our minds accept them, at least at first, to be convincing. The Penroses, father Lionel and son Roger, (no relation to Spencer and Julie Penrose) invented the most famous paradox illusion of the Penrose Stairs. Fiction illusions occur most commonly in hallucinogenic drug users, schizophrenics and others with disorders that cause hallucinations. These illusions are perceived only by the subject, and not anyone else. To see more examples of how our eyes can trick us, here's an online gallery of more optical illusions. Or, visit Convolutions, the first exhibition in our new Permanent Collection series, Raiding the Crates. Permanent collection works presented in Convolutions were chosen in response to the upcoming James Turrell and Scott Johnson exhibitions.You'll find some challenges to your visual perception by the likes of Larry Bell, Oskar Fischinger, Adam Fuss, and many more!